Joe Root was dismissed for a golden duck in his first game since the World Twenty20 final, before Yorkshire recovered against Nottinghamshire. Adam Lyth was out to the first delivery, while Gary Ballance and Root fell in successive balls, as Jake Ball (3-40) reduced Yorkshire to 24-3. Alex Lees (91 not out) and Jonny Bairstow (29) led a recovery and put on 83 for the fourth wicket. After a lengthy rain delay, Yorkshire closed 91 runs behind on 170-4. Notts have England bowler Stuart Broad and Australia's Jackson Bird in their line-up, but it was 25-year-old Ball who took centre stage in the morning session. Ball, who toured this winter with England Lions, trapped Lyth leg before wicket with the day's first delivery and then dismissed two more England batsmen in his fourth over. Ballance edged behind to Chris Read for seven, before Root was caught low by Riki Wessels at first slip a ball later. Bairstow hit four fours in 71 minutes at the crease but was lbw to Harry Gurney for 29. Captain Andrew Gale (21 not out) joined Lees with Yorkshire on 107-4 and the pair added 15 before the lunch break with the visitors on 122-4. 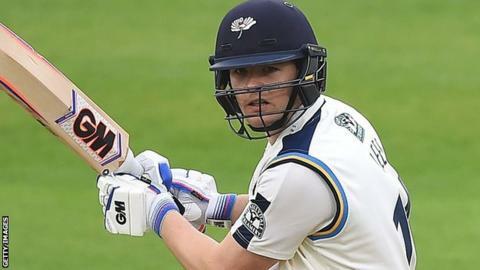 Rain then delayed play until 17:45 BST and Yorkshire added 48 runs before close, as Lees and Gale took their fifth-wicket partnership to an unbroken 63. Yorkshire were particularly indebted to the resilience of Lees, who has 12 fours to his name in an innings that has so far lasted for 130 balls.